Regardless if you desire the iPad or feel it missed the mark, it is destined to be junk. I know this with absolute conviction because all gadgets become junk. And I should know, I have an impressive gadget graveyard. Each and every one of my devices was at one time a treasure. Let me take you through some favorites. 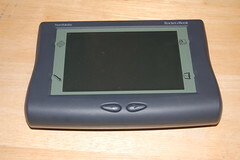 Rocket eBook Reader: This was my first eBook reader – bought in the late 90s at Barnes and Noble. Had many features not found on the original Kindle including a backlit screen, a case, and a stylus. It connected to the computer via a serial connection. Didn’t buy too many books, mostly downloaded content to it for offline reading (pre smartphone). Worked pretty well, particularly for reading in bed – but it was a bit heavy. Charged and synched via docking base. I still have the original packaging on this one. 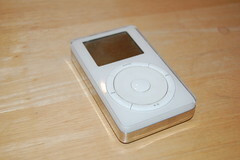 Original 5 GB iPod (with a real wheel and no dock): I bought the first released iPod – what a thrill. I really wish I saved the packaging too (back when Apple was on environmental watch lists). It didn’t take long to understand this product was going to be a hit. This particular unit can only be connecte d/charged with a (big) Firewire cable – my last computer with such a port is about to be retired. I have not used this unit in years. I should probably remove the battery, but I can’t. Rex electronic organizer: This was my all time favorite organizer from the box of “PDAs Past”. It never caught mainstream attention like the Palm products. It was a PCMCIA card itself and sync’ed with Outlook. It has a serial dock for desktop use. It was my first and favorite solution for Outlook to PDA. Very small, shirt pocket size. It was a one-way (PC to Rex) data stream, so there was no synchronization. It had a small paper pad to jot new appointments (after I verified I was available). Acquired by Xircom, a leader in PCMCIA modems, got lost when Intel bought Xircom. Last Trusync software released by Starfish was for WindowsME. Nintendo64 Console and Games: This is still actively connected and probably gets more game time than the Wii. Esp now, the used games are plentiful and cheap… the kids scoff at it until they are playing (for hours). VCRs: I have too many. Still use a Go Deck DVD/VHS model, but I can’t recall the last time a VHS tape was in it. I was really proud of my JVC deck in 1989 (still have it), the first I had with a real-time counter and a skip 30 seconds button on the remote. Mirra Back-Up: This is still reasonably current hardware and a great concept equally killed by cloud services and Seagate. It is sort of a NAS packaged as a seamless backup device. A software client passively backed-up modified files over the LAN. Besides backups, it had an ingenuous feature via Mirra.com that provided secure remote access to files stored on it from any web browser. Seagate bought the company and never released any new drivers. I’ve heard rumors it works on Windows7, but it didn’t on Vista. Unfortunately, its own OS prevents it from being reused as a NAS. Casio BOSS PDA: My first PDA. I don’t have the actual unit any more, but I still have a backup of my data on a proprietary 64 KB RAM card about the size of a business card. I have actor Mark Harmon’s home number on the RAM card. Watches: I’v e got quite the watch drawer, but two stand out. 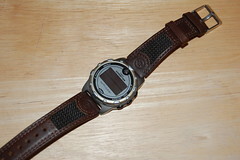 The Seiko Silver Wave circa 1980 was one of the first LCD digital watches that was water resistant. The buttons must have been hermetically sealed as there were always finger dents. I’ve also got a wonderful Timex Expedition DataLink which synchronized appointments with Microsoft’s SchedulePlus. It was a visual OTA sync – hold the watch up to the monitor and a form of barcodes scanned across the CRT filled with appointment details. It’s all about the sync. Both this watch and the Rex are useless because they can’t sync any more. I must say my current Android Phone would be severely hampered without Google Calendar or Gmail synchronization. The fact is the hardware will likely outlive the services. Calculators: Look at these babies – absolutely revolutionary at the time. I’ve sold many of my favorites on eBay – some of the HPs held their value well. 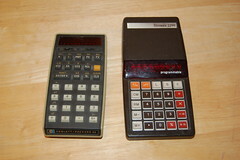 To this day, the 12C (not shown) remains my preferred calculator… I bought my first in 1987 for $125 – there are not very many calculators from 1987 that are still for sale new today (and it’s half the price). The 12C isn’t junk, but will be someday. Everyone of these items were remarkable treasures when I got them. Each one now challenges me with lawful disposal. This is only the stuff I kept too, I’ve had some beauties – like the Apple Cube, a Mattel football game, or my original Sony Walkman cassette player (not the Walkman II which was the hit). Recently, I took my iPod 3G into the Apple store for service. Its 40 GB drive failed, and up until this summer I still used it regularly. The store staff were in shock to see such an old device…. hmm guessing I bought it around 2005 (of course most of the store staff weren’t born yet). They offered to replace the hard drive, but at a higher price than a new iPod. I wasn’t too surprised, but I don’t get it. Why does technology have to be disposable? I took it to a neighborhood Mac repair shop and they fixed it for $40. Hardware has a chance – but software doesn’t. Many of our devices are completely dependent on cloud services; XM radios, cell phones, satellite receivers, pagers are all totally useless when the service or tech standard disappears. Admittedly, I don’t use my rotary Western Electric phones any more, but at least I could. I bought a Kindle for our family vacation last summer. It was great, but I promptly sold it on Ebay when we got back. It was my plan all along, I considered it a rental. I will buy another this summer and come out way ahead. I would have done better if Amazon hadn’t lowered the price during the trip. Technology keeps getting better and cheaper. the original iPhone was $599 (2007) and now sells for $99 (and is better). That being said, I don’t think I will be buying an iPad the first year (if at all).